Often times, when thinking about an extinct attraction, enthusiasts tend to get whipped into a fever pitch about how incredible the experience was and bemoan the loss of the amazing attraction. That isn’t to say this isn’t a valid approach, and I have had more than one fit over a lost attraction myself, but today, I thought we would take a different approach and go back to the beginning. The beginning of what, you might ask? To the very beginning of life on Earth, or more appropriately the beginning of 20,000 Leagues Under the Sea. Guest approaching their underwater voyage could hear Captain Nemo discussing the merits of the seas with a mystical, almost romantic, recollection. As he expanded upon the abundance of creatures, resources, and adventures to be had in the great deep, he also offered up a potential new name for our planet, Oceanus. This journey through the Polar Ice Caps and through Atlantis, as well as through menacing tentacles, meant that an entire fleet of submarines had to be constructed for Walt Disney World. This fleet, which would end up numbering twelve submarines before it was finished (fourteen if you count the two prop subs that are attacked during the voyage), and their design was the brainchild of George McGinnis. Meanwhile, over in Tampa, Bob Gurr had the task of merging all of the unruly drawings and electrical diagrams, not to mention the hull assembly of the submarines themselves. Between the shipyards of Morgan Yacht and Tampa Ship, the pieces came together. Some of you may have already guessed the problem, the 20,000 Leagues Under the Sea subs were extremely large, and they had to be transported from Tampa to Walt Disney World. The route to transport these underwater marvels had to dodge power lines, stay clear of the low clearance underpasses, and worry about the size, weight, and awkward shape of the submarines. As with all Disney projects, the team found a way to make the difficult look easy. 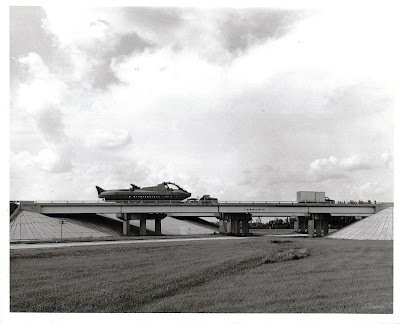 And while most of us can remember viewing the subs plying their watery course in the attraction, how many of us can say that we saw the subs motoring down the highway, as in this 1971 photograph from Walt Disney Productions?